Special offers Portland Special offers U.S.A. This Portland hotel is a 2-minute drive from the Oregon Convention Center. The design hotel offers an on-site restaurant, live music club and unique guest accommodations with free Wi-Fi. Jupiter Hotel features a 32-inch flat-screen TV and MP3 docking station in every guest room. The rooms are also equipped with environmentally friendly bath amenities and painted murals on the walls. DougFir Restaurant & Lounge at the Jupiter is open for breakfast, lunch and dinner. Happy hour specials and late-night dining are also available. Downtown Portland is a 5-minute drive from the Jupiter. The Rose Garden Arena is one mile away. Situated within easy walking distance of downtown, this luxury hotel offers full-service facilities and first-class service just steps from Portland's theaters, restaurants and shopping centers. The Downtown Streetcar stops right outside the Governor and provides service to the Pearl District, shopping areas and the South Waterfront. Visit the knowledgeable concierge staff for reservations at the best area restaurants or information on nearby attractions. Relax in a spacious guestroom boasting pillow-top mattresses, plush linens and terrycloth robes. Stay in and order a delicious meal from the Governor Hotel's 24-hour room service or enjoy a well-cooked steak at the on-site restaurant. Nightly turndown service is available upon request. On the edge of the Willamette River in Portland's modern South Waterfront District, this luxury boutique hotel has relaxing spa services in a scenic location just 8 minutes from downtown Portland. River's Edge features a state-of-the-art spa, which offers 60 health and beauty therapies for the well-being of body and mind. Each treatment is individually customized according to the results of a self-assessment. The riverfront Aquariva restaurant has upscale Italian-influenced cuisine and features a full bar. Adjacent to Cottonwood Bay on the Willamette River, River's Edge Hotel and Spa features convenient access to the protected green space. Enjoy 800 square-feet of protected natural habitat that encourages a variety of beautiful butterfly species. Providing free airport shuttle service as well as many additional free amenities, this hotel is a short distance from the Oregon Convention Center and offers easy access to nearby attractions. The Hilton Garden Portland Airport hotel ideally places guests close to the sites of downtown Portland, including the Rose Garden Arena. Several corporate offices, such as Hewlett Packard and General Electric, are also nearby. With an indoor swimming pool, in-room microwaves and refrigerators and an on-site restaurant, every stay at the Portland Airport Hilton Garden is sure to be pleasant. Guests at the hotel will also appreciate the on-site convenience store and modern fitness center. Situated in the heart of downtown Portland, steps from major area attractions, this hotel elegantly combines the historic charm of the building with today's latest technologies and conveniences. The Embassy Suites Portland-Downtown places guests only minutes from the Oregon Convention Center, Portland State University and a number of museums. The city's light-rail transportation system is also within walking distance and provides instant access to all areas of the city. In addition to spacious accommodations, the downtown Portland Embassy Suites features in-room flat-screen TVs and on-site spa services. Guests at the hotel will also appreciate the free cooked-to-order breakfast as well as the on-site gourmet restaurant, Portland Steak and Chophouse. Less than a 5-minute walk from The Max Lightrail, this hotel features an on site restaurant and bar. Rooms have cable TV with pay-per-view options. Free Wi-Fi is available in the lobby. A small fridge and coffee-making facilities are provided in all guest rooms at the Hilton Portland and Executive Tower. A work desk and ironing facilities are also included. Bistro 921, available at the Portland Hilton Executive Tower, serves classic American cuisine. 921 Bar features evening cocktails. A pool and fitness center is included at the hotel. A 24-hour business center and a concierge desk are available for guest convenience. The Rose Garden Arena is 2 miles from the hotel. Washington Park and the Oregon Zoo are just a 10-minute drive away. Ideally situated at the entrance of Portland International Airport, this hotel in Portland, Oregon offers convenient services in a prime location near the Columbia River Gorge recreation area. Embassy Suites Portland is just steps from Cascade Station, which offers more than 800,000 ft² of retail shopping space. The MAX Light Rail Service is nearby and offers easy transportation to several popular attractions in Portland, Hillsboro and Gresham. Downtown Portland and its attractions are also just minutes away. Enjoy a variety of amenities at Portland Embassy Suites. Wake up with a free cooked-to-order breakfast and appreciate the nightly Manager's Reception. The hotel also features a complimentary airport shuttle upon request. This environmentally friendly hotel features 2 on site restaurants and an outdoor pool. Rooms offer a flat-screen cable TV. The Rose Garden Arena is a 5 minute drive away. The air-conditioned rooms at the DoubleTree by Hilton Portland feature a work desk. The private bathroom offers a hairdryer. Some rooms boast views of the Portland skyline or Mt. Hood. Gather Food and Drink offers small plates featuring local Northwest flavors. Multnomah Grille prides itself on fresh, local, organic, and sustainable ingredients. Guests can enjoy comfort food with many vegan and vegetarian options. Room service is available. A 24-hour fitness center and a 24-hour business center are both available for guest convenience at the Portland DoubleTree by Hilton. The Oregon Convention Center is a 10 minute walk from the hotel. And Lloyd Center Mall is across the street. Located off Interstate 205, this hotel offers shuttle service to Portland International Airport, less than a 10 minute drive away. Free Wi-Fi and a daily hot breakfast are also provided. Cable TV, a microwave and a small refrigerator are found in each bright room at Holiday Inn Express Portland Airport. A work desk and tea and coffee-making facilities are also included. Guests of the Portland Airport Holiday Inn Express can enjoy the on-site hot tub, sauna and fitness center. A business center and newspapers are also available. Rocky Butte State Park is 5 miles from the hotel. Downtown Portland is 10 miles away. A 2-minute walk from Tom McCall Waterfront Park, this contemporary hotel features an on-site bistro and bar and a 24-hour front desk. All rooms include free Wi-Fi. A flat-screen TV with extended cable channels is provided in each air-conditioned guest room at Hotel Rose. Rooms have a work desk and a private bathroom with free toiletries. H5O bistro and bar is located at Hotel Rose. The restaurant features a menu with fresh, locally grown organic ingredients. Guests can enjoy creative cocktails at the bar which features an extensive wine list. A business center is available to guests at Portland Hotel Rose. Guests can also work out in the on-site fitness center. The Rose Quarter sports and entertainment district is 2 miles from this hotel. Portland International Airport (PDX) is a 15-minute drive away. This Portland hotel is only minutes from downtown Gresham and Portland International Airport. The hotel offers free high-speed internet access and a restaurant and lounge. Four Points by Sheraton Portland East is completely non-smoking. The hotel features an indoor pool, fitness center and 24-hour business center. Guest rooms at the Portland East Four Points are equipped with refrigerators and microwaves. Work desks and free bottled water are also included. Francis Xavier's Restaurant at the Four Points in Portland is open for breakfast, lunch and dinner. De Absolute Lounge, also on-site, serves cocktails. This hotel is located a 10-minute drive from Portland International Airport. The hotel offers free Wi-Fi, a daily breakfast and a 24-hour front desk. Days Inn Portland Airport features a 25-inch cable TV and free local phone calls in each guest room. Rooms are also equipped with a microwave and mini-refrigerator. The 82nd Street MAX Light Rail Station is a one-minute walk from the Portland Airport Days Inn. Downtown Portland is 4 miles away. Located 7 miles from the Portland International Airport, this East Portland hotel features free Wi-Fi and a daily continental breakfast. A microwave and compact fridge are included in each guest room. A cable TV with HBO film channels is available in each room at Econo Lodge East Port. A hair dryer is offered in the en suite bathroom. A convenience store and a newsstand are located on the premises for guest convenience. Free parking is provided. Clackamas Town Center is 3 miles away from East Port Econo Lodge. Portland State University is 15 minutes’ drive away. Located on Highway 26, just south of downtown Portland, Oregon, this mini-suite property provides guests with comfortable accommodations in a convenient location, ideal for both business travelers and tourists. The Briarwood Suites are ideally situated with easy access to a number of area highways, providing guests with instant and easy access to the surrounding areas, including the downtown Portland area. While staying at the Briarwood, guests can enjoy a variety of thoughtful amenities, including complimentary wireless internet access as well as a complimentary continental breakfast. This unique motel is centrally located in the heart of the Rose Quarter district of Portland within walking distance of downtown and light rail, bus and train transportation. Portland Pensione features spacious guest rooms with convenient mini-fridges and microwaves. Attractions such as the Oregon Convention Center and Lloyd Center are within walking distance of the property. Several dining facilities are also near the Pensione. Situated in the historic Nob Hill shopping district, this completely non-smoking Portland, Oregon hotel provides free high-speed internet access, a microwave and a mini-refrigerator in each guestroom. Begin the day at the Holiday Inn Express Hotel & Suites Portland-Northwest Downtown with a free hot breakfast, featuring a variety of fresh food, juice and coffee. After a day of sightseeing, enjoy the indoor pool, relax in the whirlpool or work out in the 24-hour fitness center. The Oregon Convention Center and Rose Garden Arena event venue are just a short drive from the Portland-Northwest Downtown Holiday Inn Express. Numerous activities including hiking, fishing and shopping are also easily accessible. Offering free shuttles to and from Portland International Airport and sites within a 5-mile radius, this pet-friendly property in Portland, Oregon is a short drive from the Oregon Zoo. The Staybridge Suites Portland-Airport provides a fully equipped kitchen and free high-speed internet access in each guest suite. Guests can enjoy the hot breakfast served daily, featuring a selection of fresh food, juice and coffee. Before a day of sightseeing, guests can relax in the indoor pool or work out in the 24-hour fitness center. There are numerous activities to take part in including hiking, golfing and shopping. 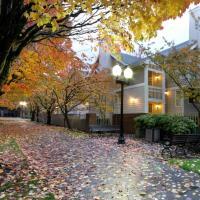 These are all available a short distance away from the Portland-Airport Staybridge Suites. The Oregon Museum of Science & Industry and the Portland Japanese Garden are also easily accessible. Providing a free hot breakfast daily and a heated indoor pool, this hotel located in Portland, Oregon is only a short distance from downtown Portland and historic Fort Vancouver. The Holiday Inn Express Hotel & Suites Portland - Jantzen Beach features free high-speed internet access, a microwave and a mini-refrigerator in each guest room. Work out in the on-site fitness center or relax in the whirlpool and sauna. Take advantage of the numerous activities including skiing, boating and golfing all available a short distance from the Portland - Jantzen Beach Holiday Inn Express. Other attractions located only a short drive away include Portland Meadows Racetrack and the University of Portland. Offering free shuttles to and from Portland International Airport and sites within a 2-mile (3.2km) radius, this completely smoke-free Portland, Oregon hotel is only moments from Cascade Station shopping center. Free wireless high-speed internet access is available in each guestroom at the Holiday Inn Portland-Airport I-205. Breakfast, lunch and dinner are served daily at the hotel's on-site restaurant, Latitude 45 Degrees. After a day of sightseeing, relax in the indoor pool and whirlpool. After a short drive from the Portland-Airport Holiday Inn, spend the day exploring downtown Portland or visit the Portland Japanese Garden. Columbia River Gorge National Scenic Area and Mount St. Helens are within driving distance of the hotel. Right off Interstate 205 and just 5 minutes from Portland International Airport, this all-suite hotel features a free shuttle around the local area and comfortable accommodations with flat-screen TVs. The suites at the Portland Airport Candlewood Suites are equipped with free Wi-Fi. A DVD player and iPod docking station are also provided. The kitchen is complete with stovetop, microwave, and refrigerator. Cookware and dishware are provided. This Portland, Oregon hotel includes a gym and business center. A 24-hour convenience store is located on-site. A concierge desk is also available. Downtown Portland is 15 minutes from Candlewood Suites Portland Airport. Colwood Golf Course is less than 5 minutes from the hotel. Offering free shuttle service to nearby Portland International Airport, this hotel has self catering accommodation with free Wi-Fi. From the on-site MAX Light Rail station, downtown Portland is minutes away. The Residence Inn by Marriott Portland Airport at Cascade Station has large suites with separate sleeping and living areas. The kitchen is equipped with stove, dishwasher and conventional oven. The 32 inch flat-screen TV has cable channels. Guests can go for a swim in the indoor saltwater pool or relax in the hot tub. The on-site fitness center comes with cardio equipment and free weights. The hotel serves a extended hot breakfast buffet every morning. Guests can mix in with other guests at the social evenings, which are organised 3 times a week. Colwood Golf Course is less than a mile away from the hotel. This Portland, Oregon hotel is adjacent to the Oregon Convention Center and the Rose Garden Arena. It has a free downtown area shuttle service, a fitness center and outdoor pool. Coffee-making facilities, a work desk, and spacious sitting area are featured in all rooms at the Courtyard Portland Downtown Convention Center. Rooms also include free Wi-Fi and wired internet. This Central Portland Courtyard hotel also offers meeting rooms equipped with a range of business amenities, as well as free Wi-Fi and free wired internet. Charley’s on Grand Restaurant serves contemporary cuisine and is open for breakfast, lunch and dinner. Guests can enjoy meals in a casual setting indoors, or on the outdoor patio. The hotel is 2 minute drive from Lloyd Center shopping mall. The The Oregon Zoo and Hoyt Arboretum are within 5 miles of the hotel. Less than a 10 minute walk from the Oregon Convention Center and The Rose Garden Arena, this Portland, Oregon hotel offers a free airport shuttle to the Portland International Airport. Free Wi-Fi is provided. A Keurig coffeemaker, a microwave and a mini-refrigerator are included in every room at the Crowne Plaza Hotel Portland-Downtown Convention Center. Each room also includes a DVD player, a DVD lending library, and a cable TV. The Portland Crowne Plaza hotel offers an indoor pool and a sports court. A 24-hour fitness center and a rental car desk are also available on site. MAX Light Rail and Streetcar stops in front of the hotel and allows for easy city exploration. The Oregon Zoo is a short drive from the Portland-Downtown Convention Center Crowne Plaza Hotel. Oregon’s Museum of Science and Industry is just minutes from the hotel. This hotel is moments from Portland International Airport and Flightcraft, Incorporated. The hotel offers free 24-hour airport shuttle service, guest rooms with free wireless internet and an on-site restaurant. Sheraton Portland Airport features completely non-smoking guest rooms with coffee makers. Room service is available 24 hours. Guests at the Portland Airport Sheraton can swim in the indoor pool or use the fully equipped fitness center. A business center and 24-hour concierge services are also available. Columbia Grill & Bar at the Sheraton at Portland Airport serves American cuisine. This 5-star hotel in Portland, Oregon is next to Portland's Pioneer Square. The hotel has 2 on site restaurants and free Wi-Fi in every guest room. Every guest room at The Nines, a Luxury Collection Hotel features a 42-inch flat-screen TV with a DVD player and in-room movies. In-room massage treatments are also available. Room service is available 24-hours. The Nines, a Luxury Collection Hotel features a 24-hour fitness center and business center. A pool room is featured on site and includes pool tables. Guests can visit the Portland Art Museum or the Japanese Gardens which are both within walking distance of The Nines. The Oregon Zoo a 15-minute drive from the hotel. This Portland, Oregon hotel is a 5 minute drive from the Portland Expo Center and Portland International Airport. Free airport shuttle service and outdoor hot tub are provided at the hotel. The Portland Meadows Best Western is entirely non-smoking. Wi-Fi is available free of charge and a full hot breakfast is served every morning. Guests can also use the 24-hour front desk, business center, and laundry facilities. Each guest room at the Best Western Portland comes with a microwave and fridge. Cable TV and an in-room coffee maker are also provided. Downtown Portland is within driving distance of the Best Western Inn at the Meadows. Portland Children’s Museum is nearby. This hotel is a 10-minute drive from Portland International Airport. The hotel features a free airport shuttle service, serves a daily hot breakfast and offers an outdoor swimming pool. Howard Johnson Portland features free Wi-Fi and cable TV with HBO movie channels in every guest room. Each pet-friendly room is equipped with coffee makers and ironing facilities. Public transportation is within walking distance of the hotel and the Oregon Convention Center is a 12-minute drive from the Portland Howard Johnson. The Oregon Zoo is about 10 miles away. Long-term airport parking is available at this hotel. This Portland, Oregon hotel is located 2-blocks from a Max Light Train Station. This hotel features in-room massages, tour desk and a 24-hour gym. Guests at the Westin Portland can dine at the Daily Grill, which features local beers and American cuisine. The hotel offers laundry service and valet parking. The staff of the hotel is multilingual. The Portland Westin rooms come with an iPod docking station and a desk. The hotel offers 24-hour room service. The Westin is a 15 minute walk of Portland State University. The hotel is located a 10 minute walk from Portland’s Pearl District and Portland Art Museum. 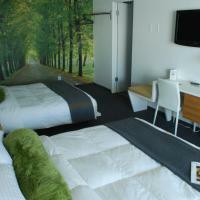 This Portland, Oregon hotel is located 2 miles from the Portland International Airport. 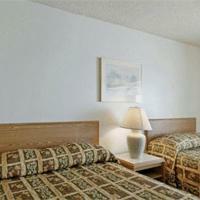 Free airport shuttle services and guest suites with free Wi-Fi are offered at this all-suites hotel. A satellite TV with premium channels is featured in all suites at the Best Value Inn Portland Airport. A small fridge and coffee-making facilities are included. A sitting area with sofa bed and work desk are provided for convenience. Select rooms have either a kitchenette or microwave. Portland Airport Best Value Inn features an outdoor pool and buffet breakfast. Guests can bring their pets and take advantage of the laundry facilities and business services. Located 9 miles from downtown Portland, the Americas Best Value Inn Portland Airport is also within walking distance of many restaurants. The Portland Zoo and Rose Gardens are both within a 30 minute drive of the hotel. This design hotel in downtown Portland is only a 5-minute drive from Portland State University. The hotel offers free Wi-Fi, unique guest rooms with painted murals and an on-site restaurant. Ace Hotel Portland features an 18-inch flat-screen TV in every guest room. The private bathrooms offer a stand-up shower or claw foot bathtub. Some rooms offer views of the Pearl District. Clyde Common restaurant at the Portland Ace features long communal tables and an open kitchen. Guests can also have a cup of coffee from the hotel's Stumptown Coffee or a bagel from Kenny & Zuke's. The Portland Art Museum is a 10-minute walk from the Ace Hotel. Governor Tom McCall Waterfront Park is less than one mile away. This Oregon hotel features an indoor heated pool and free shuttle service to and from Portland International Airport. The Oregon Convention Center is 10 miles from the hotel. Every room at the Clarion Hotel Portland provides beautiful lake views, free Wi-Fi and cable TV. A coffee maker, refrigerator and microwave are also included. A gym and laundry facilities are available at the Portland Clarion Hotel. The hotel offers a daily hot breakfast buffet and an evening reception on select days. Downtown Portland is 11 miles from the Clarion Portland. The Rose Quarter Entertainment and Sports Complex is 10 miles away and the Oregon Zoo is 14 miles from the hotel. A one-minute walk from Portland’s Pearl District, this hotel features a daily extended continental breakfast. All rooms have a full kitchen. A 24-hour fitness center is on site. Featuring free Wi-Fi, rooms at The Mark Spencer Hotel Portland have coffee makers and ironing facilities. Cable TV is also included. Individualized voice mail is available for added convenience. Guests of Mark Spencer Hotel can enjoy an afternoon tea complete with biscuits and a copy of The New York Times daily between 3 pm and 6 pm. An evening wine reception gives guests a chance to relax and socialize. The Mark Spencer is a 2-minute walk from Powell’s Books, the world’s largest new and used bookstore. The Portland Japanese Garden is 2 miles from the property. There is a convenient street car stop in front of the hotel. Featuring a seasonal outdoor swimming pool, this Portland hotel is 4 miles from Portland International Airport and provides a free 24-hour airport shuttle. An on-site coffee shop is also featured at the hotel. Guest rooms at the Portland Airport Rodeway Inn come equipped with cable TV and in-room coffeemakers. Wake-up call services are also provided for added convenience. This Rodeway Inn Portland hotel is completely non-smoking. Guests can take advantage of the free weekday newspapers and fax and copying services which are both in the lobby. The University of Portland and Portland State University are both a 15-minute drive from the Portland Rodeway Inn. The Oregon Convention Center is within a 10-minute drive of the hotel and Washington Park is 20 minutes away. This hotel is located in downtown Portland, Oregon and is within a 15-minute walk of Portland State University. This hotel features a 24-hour front desk and free Wi-Fi in every room. Rooms at the AAE Portland Downtown Value Inn are equipped with a microwave and refrigerator. The rooms also have cable TV with HBO. The AAE Value Inn Downtown Portland is 2 miles from the Oregon Zoo. The hotel is one mile from the Portland Center for the Performing Arts and the Oregon Museum of Science and Industry. This hotel is within a 10-minute drive of Portland International Airport and 5 miles from downtown. The hotel offers a daily continental breakfast, free Wi-Fi and an indoor pool. Comfort Inn Portland features a microwave and refrigerator in every guest room. Cable TV and a coffee maker are also provided in each room. Guests at the Portland Comfort Inn can use the jacuzzi or the gym. Laundry facilities and a 24-hour front desk are also available. The 82nd Avenue MAX Train Station is only an one-minute drive away. The Lloyd Center shopping mall is 5 miles away. ? Located 3 miles from Portland International Airport, this hotel features a seasonal outdoor pool. It serves a daily continental breakfast. All guest rooms offer free Wi-Fi. A cable TV and a work desk with a seating area are provided in every air-conditioned guest room at Travelodge Portland Airport. For convenience, each room includes a microwave, a refrigerator and a hairdryer. Guests of Portland Airport Travelodge have access to the on-site fitness centre. A guest launderette is available. Central Portland is 8 miles away from this motel. Home of the Portland Trail Blazers NBA team, Rose Quarter is 12 minutes’ drive away. Portland Rose Gardens are 10 miles from this Travelodge. This boutique hotel is in downtown Portland, a 5 minute walk from the Portland Art Museum. A fire pit and furnished patio is available. Rooms feature a flat-screen HD cable TV. Free Wi-Fi is available in all modern guest rooms at the Hotel Modera. A work desk, small fridge, and coffee-making facilities are included. Over 500 pieces of local art are on display in the Modera Hotel Portland. A 24-hour concierge service, assisting guests with a variety of local attractions, is available. Guests can take advantage of free passes to a nearby 24-hour fitness center and adult lap pool. The gym is one block from the hotel. Nel Centro restaurant is featured on site, offering dishes inspired from the French and Italian Rivera cuisine. Waterfront Park and Rock Bottom Restaurant and Brewery are both within a 10 minute walk from the hotel. Located in Portland, this completely non-smoking hotel offers free 24-hour shuttle services to Portland International Airport. It features an indoor heated pool with jacuzzi and rooms with free Wi-Fi. Comfort Inn & Suites-Portland Airport offers guest rooms with a microwave and a refrigerator. They are also furnished with coffee facilities and a desk. Massage services are available at Portland Comfort Inn & Suites. A business center and laundry facilities are on site as well. Oregon Convention Center is 7.9-miles away. Portland Airport Comfort Inn & Suites is 8.6-miles from the University of Portland. This Portland hotel is on the waterfront less than a 5 minute walk from Riverplace Marina, which features shopping and dining. The hotel offers rooms with flat-screen TVs. Portland Marriott Downtown Waterfront rooms come with a marble bathroom and work desk. The hotel offers room service. Dining options at the Portland Marriott include Truss, featuring a seasonal menu that features local specialties from the Willamette and Columbia Valleys. An extensive wine list is also provided. The Lobby Cafe and Bar is open for breakfast, lunch, and dinner, offering early morning coffee, evening appetizers, and cocktails. Guests at the Downtown Portland Marriott can swim in the indoor pool, relax in the hot tub or work out in the gym. The Marriott Downtown is 2 miles from the Oregon Museum of Science and Industry and the Oregon Convention Center. Four blocks from the Southwest 10th & Alder MAX station, this Portland hotel features a gym. The Oregon Zoo is 2.8 miles away and guest rooms include cable TV with HBO. Each spacious room at the Portland Marriott City Center is furnished with coffee facilities and flat-screen TVs. Pay-per-view movies are also available. City Center Portland Marriott includes the Mez on Broadway restaurant. It is open for breakfast, lunch and dinner. For added convenience a business center and laundry facilities are also available. Less than one mile away is the Lan Su Chinese Garden. Marriott Portland City Center is 12.3 miles from Portland International Airport. This hotel is centrally located in downtown Portland, near the Willamette River and a 15-minute walk from PGE Park. It features a restaurant, gym and 32-inch LCD TV in all rooms. Each guest room at the Courtyard Portland City Center features modern décor with large pieces of artwork. A coffee maker and refrigerator as well as an iPod docking station are all included. Portland City Center Courtyard offers a full-service business center and free Wi-Fi. Laundry facilities and a gift shop are available on site. The luxury hotel’s restaurant, The Original, is open all day. Washington Park, home to the International Rose Test Garden, is a 10-minute drive from the Courtyard Portland hotel. The Oregon Convention Center and Museum of Science and Industry are also within a 10-minute drive away. The Courtyard Portland Airport is situated 1.5 miles from the Portland International Airport. It has a large fitness center, and offers spacious rooms with luxury bedding, and LCT TV. Rooms at the Courtyard Portland include a work desk and a seating area. They come equipped with free Wi-Fi, and ironing facilities. Some rooms include a sofa bed. The Bistro serves American cuisine, and is open for breakfast and dinner. The Courtyard also features a heated outdoor pool, and a whirlpool. The Courtyard Portland Airport is a 90-minute drive from Mt. Hood National Forest, and is a 45-minute drive from the Columbia River Gorge. Nearby leisure activities include hiking and biking. Located one mile from downtown Portland in the Lloyd District, this hotel is a 5-minute drive from the Rose Garden Arena. It has a fitness center and spacious suites with full kitchens. Suites at the Residence Inn Portland Downtown/ Lloyd Center come equipped with free Wi-Fi and cable TV. The kitchens include a microwave and dishwasher. Some suites have a wood-burning fireplace. In the morning guests can enjoy a buffet breakfast with hot dishes. The Residence Inn also has local restaurant delivery, and a grocery shopping service. Guests at the Residence Inn Portland Downtown/ Lloyd Center can relax in the whirlpool, or use the picnic area and barbecue facilities. Nearby recreational activities include bowling and hiking. Free parking is available. Just 3 miles from Portland International Airport, this Fairfield Inn offers free 24-hour shuttle service. Free coffee in the lobby, free Wi-Fi, and rooms with cable TV and HBO are also available. All rooms at Fairfield Inn Portland Airport have a coffee maker and ironing facilities. In-room microwaves and refrigerators are available upon request. Guests can benefit from the Fairfield Inn Portland’s fitness center. A heated outdoor swimming pool with jacuzzi is also on site. Continental breakfast is available each morning. The Market stocks a selection of snacks and beverages. A number of local restaurants are also within 5 miles’ drive. The Grotto Catholic Shrine and Botanical Garden and Coldwood Golf Course are each 3 miles from the Fairfield Inn Portland Airport. The Oregon Zoo is approximately 20 minutes’ drive. Overlooking the Columbia River, Courtyard Portland offers an outdoor patio with Mount St. Helens views. Guest rooms feature LCD TVs. A fitness center, free Wi-Fi and free parking are available. Guests can enjoy a cocktail while enjoying river and mountain views at Courtyard Portland North Harbours Riverside Verandah. Courtyard Café is open all day and serves American dishes. Free coffee is available in the lobby. Rooms at Courtyard Portland North feature feather pillows and white linens. Each has a large work area with ergonomic chair, as well as a coffee maker. Portland International Airport is less than 5 miles away. This Courtyard is ten minutes’ drive from downtown Portland. This hotel is a 3-minute drive from the Portland Expo Center, and is 6 miles from Portland International Airport. It has a heated outdoor pool, and offers spacious suites. Suites at the Residence Inn Portland North Harbour include a fully-equipped kitchen with a microwave and dishwasher. Suites also come equipped with flat-screen TVs and a marble bathroom. In the morning guests can enjoy a buffet breakfast with hot dishes. The Residence Inn also offers local restaurant delivery, and a grocery shopping service. Guests of the Residence Inn Portland North Harbour can relax in the whirlpool, or make use of the picnic area and barbecue facilities. The hotel also features a gym with cardiovascular equipment. Fairfield Inn features an indoor swimming pool and free Wi-Fi throughout the entire hotel. It is 8.6 miles from Portland International Airport and 400 metres from Portland Exposition Center. All rooms at the Fairfield Inn & Suites Portland North Harbour feature a flat-screen satellite TV and iPod docking station. Every room has an en suite bathroom, hot drink facilities and a well-lit work desk. The hotel’s restaurant serves various breakfast specialties, including the Breakfast Quiche and the Jimmy Dean breakfast sandwich. There is also an Italian-themed sports and pizza bar. Guests can relax in the indoor pool, or enjoy a workout in the fitness centre. Fairfield Inn is 5 miles from the University of Portland and 7 miles from Chinatown. Fairfield Inn & Suites Portland North Harbour is situated just off Pacific Highway 5. Free on-site car parking is available. This hotel is 10 miles from Portland Airport (PDX). It offers a gym, an indoor pool and a free shuttle within a 5-mile radius. Free Wi-Fi and free wired internet are available. The rooms at the Residence Inn Portland Downtown/RiverPlace have a full kitchen with a refrigerator, a microwave and a dishwasher. They also include a sitting area and satellite TV. The Residence Inn Portland serves a complimentary hot buffet breakfast daily. Guests can also enjoy free tea and coffee in the lobby, or visit the 24-hour Market which sells sandwiches, snacks and ice cream. The Residence Inn Portland by Marriott is conveniently located near downtown Portland entertainment district and the Oregon Convention Center. Just 3 miles from Portland International Airport, this SpringHill Suites offers free airport shuttle service. A daily hot breakfast buffet and free coffee and newspapers in the lobby are available. All rooms at SpringHill Suites Portland Airport feature a pantry area with mini-fridge, microwave and coffee maker. Each has a well-lit work space and free Wi-Fi access. Guests can workout in SpringHill Suites Portland’s indoor pool or fitness room. A 24-hour business center is available to print boarding passes. The SpringHill Suites Portland Airport is 200 feet from the Columbia River. Broadmoor Golf Course is 5 miles’ drive. Downtown Portland is approximately 15 minutes’ drive.